Are You Curious About Wine Grape Harvesting and Crushing? When last we left our well pampered hero (aka the wine grape), it was living the life of luxury, quietly converting nutrients, water and sunlight into sugars but its day of reckoning was fast approaching when its existence would literally be turned inside out. They will be ripped from their branches, thrown together with millions of other orphaned grapes and then squeezed so hard, it makes a mammogram look like a gentle massage. On that fateful day, it’s protector becomes its nemesis as the winemaker turns from nurturing parent to bloodthirsty villain. Ok…I get it…that’s a little melodramatic considering we are talking about a piece of fruit (unless you listen to the new age loons who believe plants have feelings). The point is that the winemaker changes hats from farmer to chemist/biologist/mad scientist to create the best wine possible. Up to this point, while the winemaker was in farmer mode, it was all about the fruit and the vine, striking the ideal balance of sugar and acids. Around harvest however, the winemaker changes focus to the juice that will be unceremoniously squeezed out of the grape. Picture a farmer raising a prize hog. A blue ribbon at the county fair is great but the goal is not to raise an animal that will continue to eat hundreds of dollars of food per month. That farmer is spending just as much time thinking about how tasty that ham is going to be after …well…you know what happens. From the time the fruit sets, winemakers are thinking about how to coax nature into providing the best juice to make wine. How that fateful day is chosen primarily depends on the balance of sugar and acid in the grape. Winemakers are occasionally forced to pick before the grapes are ripe if the weather begins to cool or heavy rains are expected which can cause bunches to rot or absorb too much liquid and burst. Assuming weather isn’t a contributor, there is still a fair amount of guesswork because grapes don’t ripen uniformly. Even grapes within a single bunch can range from over ripe to under ripe. The winemaker is looking for the balance of what the section of vineyard will produce when mixed together. Most smaller vineyards manually pick their grapes but the larger ones, particularly when located on flat or gently sloped terrain, can use mechanical harvesting machines. Hand harvesting is often done at night which keeps juice cooler, curtailing any premature reactions and also allows grape pickers to work harder and longer hours without frequent stops due to mid day heat. The newly harvested grapes are introduced to their first implements of medieval torture, the press and destemmer. The order depends on the type of grape and the structure that the wine maker desires to impart to the wines. Grape stems tend to be strong in tannins and other compounds and can cause wine to be bitter. The press, squeezes the juice from the grapes then the destemmer bludgeons the remaining grape pulp and separates the stems from the skins. 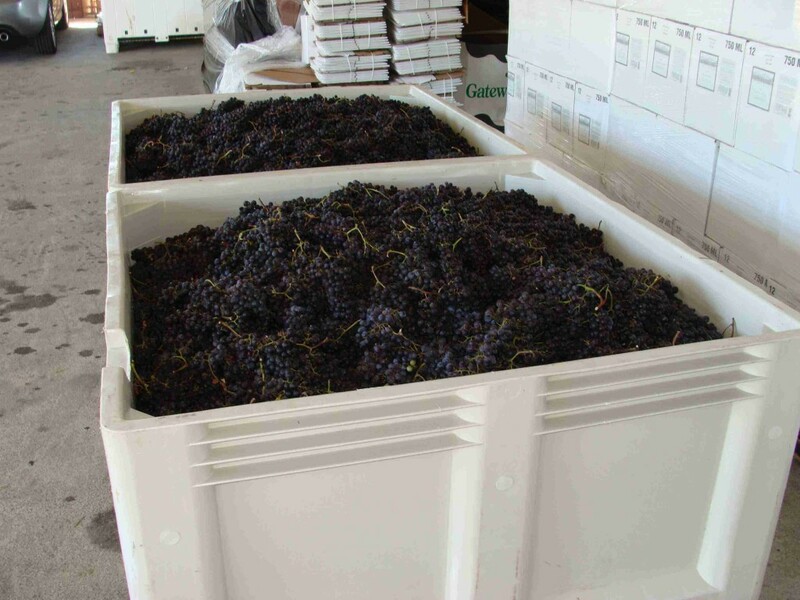 The stems are dumped into a different container to be disposed of, often returned as compost to the vineyards. With very few exceptions, the juices from wine grapes run from clear to slightly brownish yellow, even the red Varietals. For most white wines, the grape skins are separated from the juice almost immediately. The juice is sent to fermentation vessels and yeast is added and the wine will begin to ferment. For red wines where most of the color and back end structure comes from the skins, the grape skins are then reunited with the juice in a fermentation vessel so they can impart their flavors to the fledgling wine. The resulting liquid, known as “must”, contains juice, skins, parts of stems, seeds, fruit flies, other miscellaneous critters, and bits and pieces that might have fallen in. Wine making at this stage is not quite the exact science that it becomes later. Yeast is added and as the wine begins to ferment, carbonation bubbles push the skins to the top of the fermentation vessel and create a semisolid floating mat called a cap. This cap is frequently pushed back into the wine in a process called “punching” to keep the exposure to the air and liquid constant. The juice and skins can stay in the fermentation tanks for several days to several weeks, depending upon the type of wine. Before the advent of mechanization, wineries used hand processes which usually involved less “brutalizing” of the wine. One older practice in particular, gravity fed systems, are regaining advocates. Gravity fed systems allow the juice to gently run downhill from the crushing and destemming areas to fermentation and holding areas and then downhill again to the barreling area. What’s the advantage? Little unnecessary air is introduced into the wine. Even at these early stages, forcing excess air into the wine isn’t a great idea which is exactly what pumping wine from one location does and is something that most winemakers would like to avoid whenever possible. Oxygen is needed in the wine to allow the yeast to ferment, but enough is usually present by just allowing the normal oxygen exchange between the wine and the atmosphere. There is not reason to force additional air into the wine. Another older practice that is gaining popularity in the US is whole cluster (also known as whole bunch) fermentation. 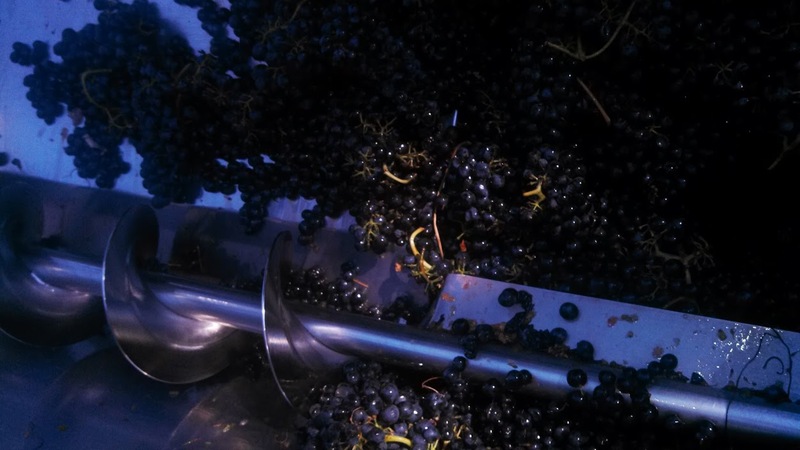 In this process, the grapes are crushed but left attached to the stems (unless of course they fall off the stems when they have had the crap beaten out of them in the press). This process imparts an earthiness to the wine that comes from the stems staying in contact with the wines for a longer period of time. If the winemaker is inexperienced with this process though, the wine can become bitter due to prolonged contact with the stems. When fermentation is finished, the wine is transferred to its long term storage vessel (usually a stainless steel tank or oak barrel) and much like a prisoner in solitary confinement, is shut away in the dark to slowly mature until bottling.